Here's a card I made recently that uses a technique of water stamping on distress ink. I used some Mermaid Lagoon distress ink, sponging it on a white piece of cardstock. I used some Fabulous Flowers stamps, spritzing them with water and stamped them onto the inked panel and let it dry. I added some contrast with black and white, adding some embossing on the lower panel and a punched border for the sentiment. Now I need more of those new distress ink colors so I can make more thank-you cards! I'm very pleased with the way this turned out! I'm sharing this over at the Simon Says Stamp Wednesday challenge which is Thanksgiving/Thanks. Have a wonderful Friday and thanks for dropping by! Gorgeous look with this technique. I also love that embossing on the bottom and the black separates the both portions nicely. I wore a shirt yesterday that was almost that same exact color. Hoping you have a wonderful day. Love the subtle images on the pretty teal color, Carol! Wonderful technique and a beautiful thank you! Another stunning card with the water stamping technique, Carol, also this one looks really wonderful!!! Love mermaid lagoon distress ink, I bought it some times ago, toghether with the other new Tim's inks, in a bargain of Craft Stash site! I'm very busy in this time, but I can't see the moment to finally use them!I will try this technique! 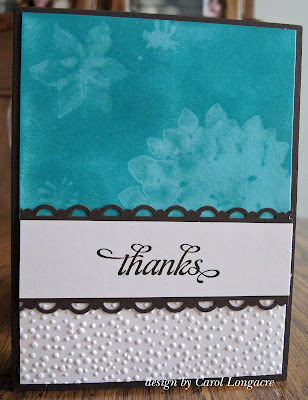 Love the withe embossed cardstock, it matches very well with the water stamping! Beautiful! It would be pretty in any color but love the Mermaid Lagoon. Wonderful card Carol! You have this technique down pat! Very pretty! A fabulous card Carol, a brilliant technique. This is so cool. I love the ghostly look. Your background is beautiful. Love the textured embossing on white as well. Gorgeous card. Love it. Thanks for playing along Simon Says Stamp Thanksgiving Wednesday Challenge.